See the original event page. See the original multilingual event page. On November 2, 2014, Men Having Babies held its largest conference ever. Hosted and co-sponsored by the JCC Manhattan, more than 250 current and future parents, surrogates, doctors, lawyers and surrogacy professionals participated in a day filled with panels, workshops and a fair featuring the largest concentration of the world’s leading surrogacy agencies and fertility clinics ever assembled. In addition to providing personal and expert advice for prospective parents, the conference featured an ethical panel, a spirited discussion of the future of surrogacy in New York State, and the first ever panel of teenagers born via surrogacy to gay parents, in a partnership with Family Equality Council. The teens mesmerized and enchanted the audience as they shared with humor and maturity their feelings, experiences and stories about their unique family situation. Read a report about the event. See the original event program. Men Having Babies in cooperation with the Center on Halsted and Howard Brown Health Center presented the first Midwestern Gay Surrogacy seminar in Chicago on September 13, 2014. More than 120 parents, prospects and professionals participated at the “Surrogacy 101” workshop, Gay Parenting Expo, reception, Exhibitor introductions, on-site consultations and information about the Gay Parenting Assistance Program and other local and national resources. Sponsorship proceeds benefited the Gay Parenting Assistance Program. The partnering organization have agreed to collaborate to provide an expanded format conference for 2015 - stay tuned for more information. View the event highlights video on YouTube! In February 2014 Men Having Babies once again partnered with the Tel Aviv Gay Center to offer a 3-day international surrogacy conference in Israel. The conference attracted over 150 intended parents, dozens of parents who came with their children for a surrogacy family reunion, agencies and clinics from around the world, public officials, and much media attention. The program include more exhibitors that ever before and new specialty panels for both gay and straight prospective parents. The focus of the conference was on international surrogacy opportunities, mostly in the USA, but also Thailand and Mexico. Proceeds from sponsorship fees benefited the Gay Parenting Assistance Program, earmarked for prospective parents from Israel. Men Having Babies and Our Family Coalition present our first Northern California seminar dedicated to biological parenting for gay men at the San Francisco LGBT Center, January 9th, 2014. Parents, prospects, professionals and allies are invited for a surrogacy 101 workshop, resource exhibit, book fair, reception, and information about the Gay Parenting Assistance Program and other ways to get involved. Additional supportive organizations include the SF LGBT Center and Gay Future Dads. Go to the original event page. The 2013 NYC Men Having Babies conference took place on October 6th, 2013, at the JCC in Manhattan, which also co-sponsored the event. About two hundred parents, prospects and professionals enjoyed 11 hours of educational programs. More than 30 clinics, agencies and community organizations exhibited at the expo and hosted breakout sessions, and for the first time, also offered on-site consultations. MHB provides unparalleled opportunities for any gay person considering having children through surrogacy, to get unbiased information, access a wide range of relevant service providers, and connect with others going through the process. This year the organization also added a book fair and special interest panels for gay men who are already parents, and men who are HIV positive. The conference also marked the official launch of the organization’s Gay Parenting Assistance Program. The first ever West Coast Surrogacy Seminar and Gay Parenting Expo took place May 5, 2013, at the L.A. Gay and Lesbian Center’s Village at Ed Gould Plaza. The event was organized by the nonprofit organization Men Having Babies which has previously offered similar programs in New York, Barcelona and Tel Aviv. The groundbreaking event, designed to provide the most up-to-date information to gay prospective surrogacy parents, featured 20 American and international surrogacy agencies and clinics; personal stories of surrogates and dads who have gone through the surrogacy process themselves; and panel discussions featuring legal and medical experts, a special panel on parenting for HIV positive men, and information on both independent and agency-guided surrogacy. Twenty-four breakout sessions and an expo allowed prospective parents to become more familiar with exhibiting agencies and clinics, as well as supportive community organizations. As it is our custom, proceeds from sponsorship and exhibiting fees benefited our Gay Parenting Financial Assistance Fund. In February 2013 Men Having Babies partnered with the Tel Aviv Gay Center to offer a 3-day international surrogacy conference that attracted about 200 intended parents, dozens of parents who came with their children for a surrogacy family reunion, 14 agencies and clinics from around the world, the Tel Aviv mayor, and much media attention. The program was an extended version of the successful format of our programs in the USA and Europe. The focus of the conference was on international surrogacy opportunities, mostly in the USA, but also Thailand, Mexico and Nepal. Proceeds from sponsorship fees benefited our Gay Parenting Financial Assistance Fund. See the event page for for the original event program. View the entire program in our video library! The 8th annual NYC seminar took place on September 22, 2012. The event featured a record number of exhibitors, an expanded daylong format includes 24 breakout sessions, expert and personal stories panels, and a gay parenting exhibition. About 150 prospective parents attended the expo, and several large donations were announced to the Gay Parenting Financial Assistance Fund. On Monday, Oct. 1st we gathered for a night of laughs to benefit our new financial assistance fund! The event featured popular comedian (and gay parent) Judy Gold and a lineup of top gay and gay-friendly comedians as part of the monthly benefit program at the Gotham called "Alyse Kenny Presents...It's A Charity Thing!" We are proud to have raised a significant amount thanks to the participants and generous donations from our members for raffle: two Broadway tickets (courtesy of BJ Holt), a $100 gift certificate to the Bogota Latin Bistro restaurant (thank you George Constantinou and Farid Ali Lancheros! ), and a set that includes a voucher for a free night of baby nursing services and a $100 gift card from Chapman Hill Baby, a baby nursing service and an online baby supplies and toy store. The first "Men Having Babies - Europe" took place in April at the Second European Conference of the Network of European LGBT Family Associations (NELFA), near Barcelona, Spain. The elaborate program included a comprehensive surrogacy seminar, a Gay Parenting Services Exhibit, and eight breakout sessions on topics such as ethical surrogacy practices, international surrogacy laws, know vs. anonymous egg donations, and speaking to surrogacy kids about their origin. See photo album of event! The seventh annual Men Having Babies seminar and exhibit took place October 2, 2011. Click on the image on the left for the seminar page, or you see the entire program in our video library. 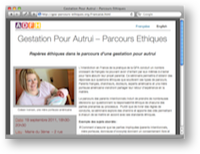 At the request of the French LGBT parenting association ADFH, we assisted in organizing a seminar in Paris on September 19, 2011. The well attended seminar featured several experts from the USA and France, as well as a surrogate and two parents. The focus was the practices that can allow people adjust their surrogacy journey to suite their ethical convictions. Click on the image on the left for the seminar page, or you see the entire program in our video library (English and French).